Henstrom Happenings: 1 more month! So my due date is in 1 month, and I am ready to be done. My sis-in-law says you have to get so uncomfortable that you will go through whatever you have to to get the baby out. I am definitely getting there!!! I am not really into taking or posting pics of myself pregnant but i have to remind myself that someday I will wish that I had taken more pics of myself pregnant. 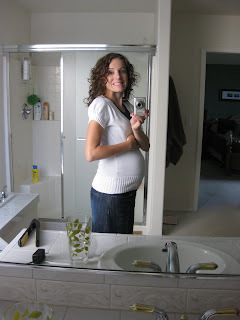 I am told that someday I will miss the pregnant days although right now I can not imagine that. So here I am at about 36 weeks. Steph you look awesome and I'm so glad that you are taking pix of your cute bump. Love ya and good luck in your last weeks! Girl you are tiny. I feel huge compared to you. How great to only have one more month. That is so exciting.